Letter of reference for immigration in Canada is a very important document. A good letter of reference can help in further processing and a bad one can become a cause of rejection of your application. Basically, purpose of writing a letter of recommendation is to provide evidence about your job experience. If you are applying for Canadian immigration, you have to mention about your skilled class. It can be A, B or O. Skilled class depends on your occupation and the experience. For instance, MBA recommendation letter will be different from the engineering letter. A letter of recommendation writing must include this information clearly. If you are confused about the content, you can also hire recommendation letter service. The professionals know what should be included in your recommendation letter according to your qualification and experience. Reference letter for immigration should include the job positions you held in a company. Clearly mention your designations. If you were working in different positions, in the same company, you have to mention all the positions separately. You have to mention the starting and ending dates for each position and the number of working hours per week. You may also require mentioning your salary and other benefits, relevant to each job. Sample letter of reference for Canada immigration can help you to know the content. How Your Ideal Letter of Reference for Immigration Should Look Like? It should be written on the letterhead of the company for which you have worked or working. It should be a signature of your supervisor or chairperson. The name and designation of the person should also be mentioned with signature. Contact information about the company should be included. It should have an official stamp of the company. Additionally, you can attach the business card of the signatory authority with it. It will make it more authentic and powerful. Include the above-mentioned information regarding your job title, dates of employment, salary per week, average hours per week and the detail of employment duties. Writing a letter of recommendation for immigration Canada this way can make it an ideal letter for recommendation. Where and How You Can Use Reference Letter for Immigration to Canada? When you are writing a reference letter to immigration Canada, you have to write it carefully. It is a compulsory document when you apply for any kind of immigration. You can use it for your benefit when you apply for immigration. It shows your experience at different positions, and an experienced worker is in high demand, in country like Canada. As far as how to use is concerned, it should be compulsory part of your file, right from the beginning. With strong writing a letter of recommendation, the immigration officer will have no excuse to reject your file. 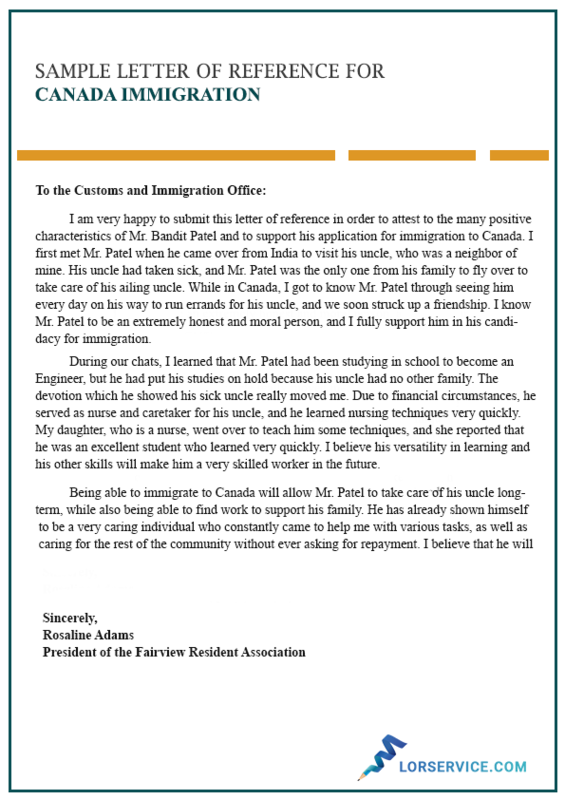 Writing a character reference letter for immigration Canada is not an ordinary task, it’s really important. People have no idea about the content of the reference letter. That is why mistakes are very common. However, some mistakes you surely have to avoid. Here we are mentioning them while making letter of relocation Canada. Every industry and occupation have its own technical language and trade words and terminologies. If you see samples, you will notice that they are written in simple language. You have to do the same. People write reference letters in technical language, but visa officers may not be from your industry. These words will be unknown to them and the letter will lose its effectiveness. So, it’s better to use simple language. A skilled level is determined by job duties. Sometimes job duties are mentioned in such a way that they meet the NOC requirements exactly. In this case, the reference letter looks a crafted letter and visa officers reject that, at once. Don’t make this mistake. The reference letter should look natural and original. Sometimes applicants mention something, which can’t be verified. The visa officers verify each and every detail, either through phone calls or by other means. So, adding something, which cannot be verified is a big mistake. You can see sample experience letter for Canada immigration, but can’t copy anything from any source. If you are confused about the content, let us help you. We offer writing services for our clients. With our expert professionals, we can help you to write variety of documents. We can write Canada letter of introduction and migration letter in Canada, along with other documents. If you need a reference letter in hurry, our professionals can provide you in short time. We work with a large team of expert writers, so we can finish this task quickly. We value the time of our clients. We promise to provide all documents in time and we never fail in that. The charges of our services are affordable for our clients. if you compare the quality of our documents with the charges, you will find them quite economical. We don’t use templates. All our documents are original and written by our experts. We provide customized documents to our clients. We understand the importance of confidentiality. All the personal and professional data of our clients is kept secure. If clients are not satisfied, we can revise the documents. Customer satisfaction is our priority. Struggling with letter of reference for immigration in Canada? Don’t worry, we are here to help. Contact us today!